A fire destroyed The Academy, Selsey in August 2016 [Image: Eddie Mitchell]. Despite the lessons of the Grenfell Tower disaster and the fact that its own school burnt down, an academy trust in southeast England has delayed a decision on whether to install a sprinkler system in the replacement. The Kemnal Academies Trust, which manages 40 schools in six counties, says the Education Funding Agency, and the Government’s own Design in Fire Safety in Schools guidelines, “no longer include an expectation that most new school buildings will be fitted with them (sprinklers)”. So the Trust says it has yet to decide whether to install sprinklers when a replacement is built for The Academy, Selsey – which was burnt to the ground in a huge blaze in August 2016. The indecision has been revealed after another huge blaze gutted Grenfell Tower in Kensington, London, with 80 people confirmed dead. It was revealed afterwards that, despite repeated calls for sprinklers to be retrofitted in high-rise blocks by coroners and by fire and rescue services, government ministers did not compel social housing providers to do so. Now we learn that government guidelines are endangering children at our schools as well. The decision on whether to fit sprinklers in the new Academy Selsey school ‘has not yet been finalised’, the trust which runs it has said. It follows BBC South Today reporting that TKAT had chosen not to fit a sprinkler system in the new school, which will be built on the site where a major fire destroyed the old secondary school in August 2016. The school did not have a sprinkler system fitted, though a fire service spokesman said at the time there was no evidence to suggest it would have prevented the rapid spread of the flames. However, Tony Morris, a retired former firefighter of 32 years, said: “Reports that the trust running the Selsey Academy do not intend to fit sprinklers in the rebuilt school are beyond belief. “Professional advice and common sense say that sprinklers should be fitted, but TKAT say they won’t, because they are ‘not a requirement’. 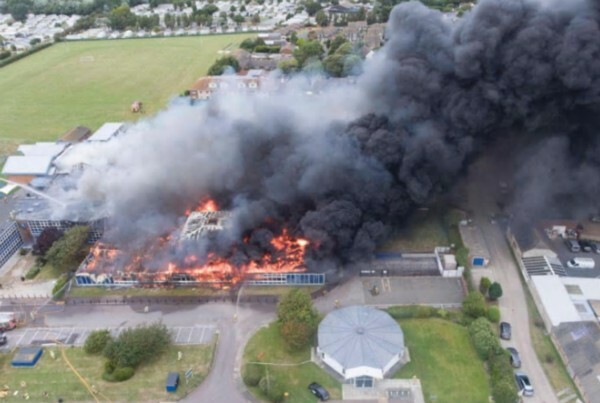 The fire at the former Selsey Academy took place in August, when pupils were away enjoying their summer holidays. If another blaze were to break out in the replacement – or any other schools where sprinklers haven’t been fitted because government guidelines do not demand it – who’s to say it won’t happen during term time? The potential death toll – of children – is horrifying. Why are our government, local authorities and regulators still sleepwalking towards tragedy? So diddly squat has happened about replacing this school since August 2016 so how much has all the alternative accommodation and disruption cost? The reason good commercial enterprises invest in sprinklers is to keep their business interruption to an absolute minimum whereas local government thinking and logic is dictated by project cost. Sprinklers would have contained the fire and in some cases put it down before it had spread. However the construction/containment also has to have robust fire breaks and materials to allow the fire brigades to attend (those fire stations that are left in the vicinity that is!) Most of the school fires happen outside of school terms/hours so having sprinklers would be an added protection to prevent the entire loss of a school which spread over the life of the asset is very reasonable investment..
What can you expect from a Trust called the Kennel Academies Trust? I think you should read that name again. Not at all Mike the misreading was deliberate as I see all Academies as dogs that have pounced at the Tory call.